Enceladus' geysers are blasting out 30 to 50 percent less material than they were 10 years ago, a new study has found. SAN FRANCISCO — The famous geysers on Saturn's icy, ocean-harboring moon Enceladus aren't what they used to be. The geysers, which blast material from Enceladus' subsurface ocean into space from the moon's south polar region, were first spotted by NASA's Saturn-orbiting Cassini spacecraft back in 2005. Now, a new study of Cassini data shows that the geysers' output has dropped by 30 to 50 percent since then. It's possible that the fissures through which the geysers spray are narrowing as more and more material accumulates on their walls, Ingersoll told Space.com. "But why they would all act together is totally beyond me," he said. 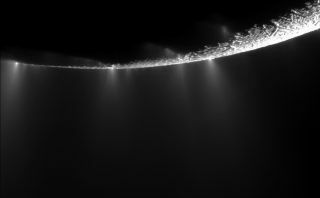 It's also possible that the water pressure in the reservoirs feeding Enceladus' jets varies considerably over relatively long time spans, Ingersoll added, though he said it's hard to imagine how such a scenario would work in practice. In 2013, a different research team led by Matthew Hedman of the University of Idaho (who was then at Cornell University) discovered that the amount of material being blasted out by the geysers varies depending on where Enceladus is in its elliptical orbit around Saturn. Specifically, the plume produced by the geysers is brighter when the moon is farther away from the ringed planet. Hedman's team, which analyzed observations made by Cassini's Visible and Infrared Mapping Spectrometer instrument, also found that the Enceladus geysers were about 50 percent dimmer in 2009 than they were in 2005, Ingersoll said. Now, Ingersoll and his colleagues, who looked at photos captured by Cassini's Imaging Science Subsystem cameras, have found that this latter trend extends through 2015. The researchers plan to submit their paper to a journal in the next few weeks, Ingersoll said. The new results will undoubtedly generate quite a bit of discussion among scientists, many of whom are keen to study Enceladus' plume in greater detail. The geysers, after all, offer a way to sample the moon's potentially life-hosting ocean without touching down. Indeed, several different research teams have been developing life-detecting mission concepts that would hunt for biosignatures in Enceladus' plume material. Cassini has found salts and carbon-containing organic compounds in the geyser spray, but that spacecraft was not designed to detect signs of life.